Whether the abdominal pressure you feel when you're bloated is caused by excess gas or fluid retention, finding ways to relieve it can really make a difference in your day. While lemon juice does not contain any natural ingredient that's going to reduce the bloat, it may help in other ways by getting you to drink more water or helping you reduce sodium intake. Consult your doctor if the bloating is frequent or you're also experiencing abdominal pain. Lemon juice is fat-free, very low in calories and an excellent source of vitamin C. The juice from one lemon, which is equal to about 3 1/2 tablespoons of lemon juice from a bottle, has 11 calories and 3 grams of carbs. It meets more than 30 percent of the daily value for vitamin C. The juice from the lemon also contains small amounts of some of the B vitamins, including thiamine, pantothenic acid, vitamin B-6 and folate, as well as some magnesium and potassium. Lemon juice is not, however, a good source of protein or fiber. If you're prone to bloating, you may notice that certain types of foods make it worse. FODMAPs -- fermentable-oligo-di-monosaccharides and polyols -- are a type of carbohydrate that the body has a difficult time digesting and absorbing, and when they reach the colon the bacteria ferments them, leading to gas and bloating. Foods high in FODMAPs, including a variety of fruits and vegetables such as apples, mangoes, peaches, mushrooms and cauliflower, can cause bloating. Eating fewer high-FODMAP foods helps decrease the bloat. 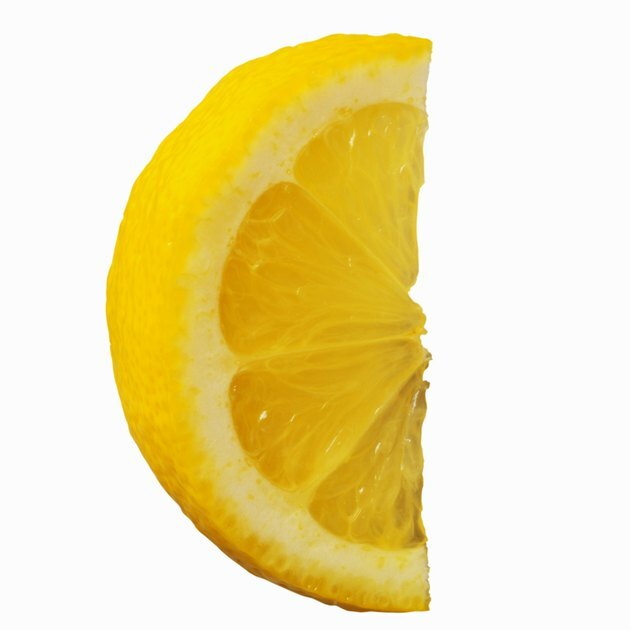 Lemons and their juice are low-FODMAP foods. It's important to drink plenty of fluids to help move food through your digestive tract when you're feeling bloated. But that doesn't mean you should guzzle soda, which can actually make the gas and bloating worse. Instead, drink more water. If you have a hard time drinking water plain, adding lemon juice can really help bolster the flavor. Drinking your lemon-flavored water at room temperature is also helpful for reducing bloating, according to Brigham and Women's Hospital. Getting too much sodium in your diet, especially from processed foods, can lead to bloating. Fresh lemon juice is naturally sodium-free, and bottled lemon juice has only 3 milligrams of sodium per tablespoon. You can reduce your intake of sodium by using lemon juice to flavor foods. For example, instead of salad dressing, you can squeeze fresh lemon juice on your salad greens. It also adds zest to fish and chicken, as well as grain and veggie side dishes. Can Club Soda Help With Bloating & Gas?